Most companies these days do social media today (In a recent survey, nearly 72% of marketers say they use social media – see survey below). Now, don’t get me wrong, I know the tangible benefits that social media brings to a company, but not having clear goals before engaging in social media nor having an accurate way to measure it is probably one of the main reasons for companies to abandon social media when they find “it’s not working”! But, I digress… What got me thinking was a recent survey conducted by KingFish media, by interviewing “457 respondents primarily split between corporate management and marketing/sales management”. 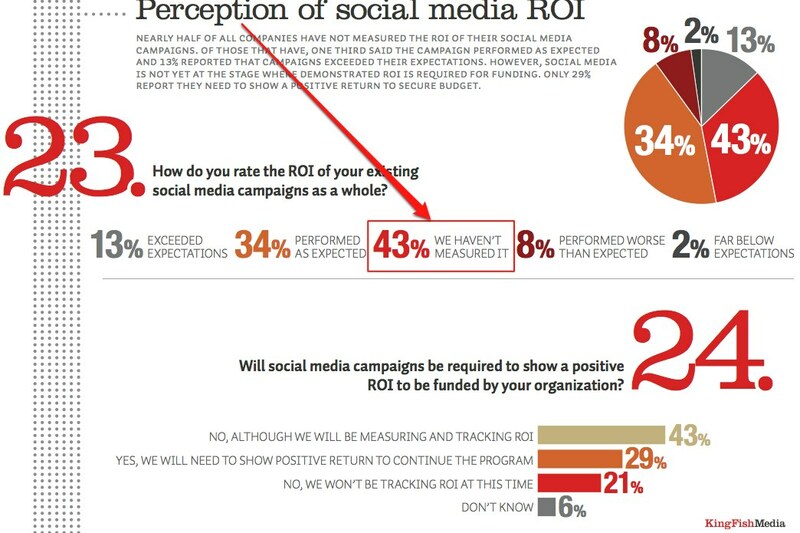 There were quite a few interesting facts that the survey unearthed, but nearly half of them (43% of marketers – see graph below) haven’t measured ROI being the most concerning. The chatter around social-media ROI is as strong as ever for two reasons: The first is simply because ROI [points to] one of the most important questions an organization can ask before green-lighting a social-media program: I could spend this budget somewhere else — Why should I spend it on social media? 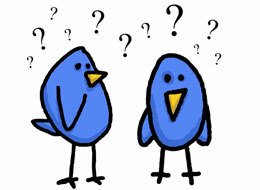 Before any other questions can be asked, you have to start with “why. But is this what companies are doing? More after the jump. So, what are companies using social media for? As expected, companies and marketers use social media (loosely defined) for two things: Sales (get leads and manage accounts) and Branding (everything else falls under this bucket). 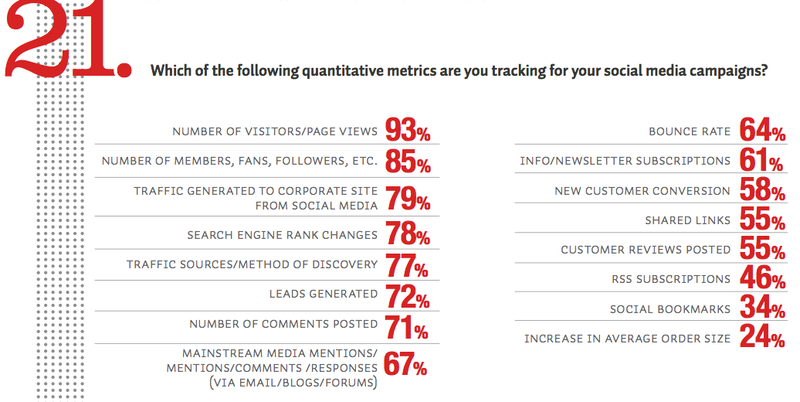 I was surprised that PR wasn’t explicitly mentioned under qualitative metrics though both PR and customer service objectives were mentioned under the quantitative metrics (see #21) section. But what do they measure…? Sales (easily the most straight forward goal) has 3 metrics around it being tracked (leads generated, new customer conversions, and increase in average order size) while most of the remaining metrics tracked are around branding. Some of the metrics are around PR (mainstream media mentions), SEO (search engine rank changes), customer service (customer reviews posted). All three of which are valid social media goals , as I’d pointed out years ago – here). Now, this is definitely NOT a place for your company to be in. The good news is that over 50% of companies (per the survey mentioned above) have clearly defined metrics and ROI. There are also gold-standard companies that are pioneering social media in terms of what it can do for your company and measuring it aggressively. Stay tuned for clear examples on how companies are using social media within the organization on this blog. Your company must be using social media (looks like most companies are). What does your company primarily use it for? But how can we measure Social Media ROI for Startups where we do not devise a specific mechanism to measure? Absolutely fascinating study. I guess we’re at the stage where social media is being accepted, slowly, but actually measuring it is still being worked out. Unfortunately, until more companies devote resources to an actual social media strategist or agency who can identify these goals (or realize they need to listen to the one they have hired) they will think it’s “not working” and revert back to antiquated forms of marketing that will also not work. Unfortunately, there is only so much the social media team can do. A little concerning that companies would get into blogging or Twitter due to the hype cycle and not see how this integrates into their existing strategies. I do think there is an ever increasing need to have a dedicated resource to help with strategy and tactics around social media. I’d recommend you take a read through the ROI of Corporate Blogging post I wrote a while back. For e.g. Increased sales efficiency would be a starter. How about you tie your newsletter to the blog? This way you can SEO optimize the content you exclusively shared only with x # of your prospects and leads. Now anyone in the public space who reads the content and stumbles upon it (via Search) is a prospective customer? There are measurement systems available, but as you said, it’s still evolving. My $0.02 would be for companies and SMBs to test it within their existing marketing goals and quantify metrics accordingly. There is value and businesses should be engaging in social media ONLY with a plan to measure it in a smart manner.